What do you do with your nights? Lots of people utilize the late night hours to “veg out” in front of the TV, “unwinding” from a day’s work and responsibilities. Sages advise the contrary! 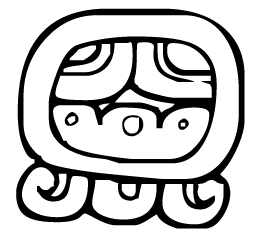 Akbal, the Mayan’s coded glyph, also beckons us to do otherwise. Today is 9 Akbal according to the Tzolkin, the 260 day Mayan calendar. The Ruler is Blue. The Blocker is orange. The Gatekeeper is Jupiter. The simple translations associated with Akbal are darkness, night, early dawn and house. My venerable Elder, Grandmother Pa’Ris’Ha recently reminded her Circle that the best time to meditate is at 3 a.m., smack dab in the heart of the night! This is the nature of Akbal’s message–which is also associated by various Mayan commentators with a sanctuary (a house of prayer), the “looks-within-place,” the abyss and Dreamspeaker. Spirituality is often associated with light and the sun. But Akbal reminds us of the spiritual nature of night and darkness. In this sense, Akbal teaches a contrary lesson. If you’re old enough, you’ll remember a “contrary” who was a character in the classic film, Little Big Man. Dustin Hoffman played a man who flip flops back and forth, living first as a “White Man” then as an “Indian.” In the course of his adventures, he humiliates a Cheyenne brave named Younger Bear who becomes a contrary, a warrior who does everything in reverse. He even rides his horse facing backwards. Grandmother Parisha has often taught us that when we dance in a circle we can go either “Sunwise” or “Spiritwise.” Sunwise is clockwise. Counterclockwise is spirit-wise. She has said that her People, the Cherokee, in many ways were “contrary.” They were a matrilineal society and they viewed the Sun as a female form, calling it “Grandmother” and “Nunda” while the moon was “Grandfather,” and Nunda of the Night. This is quite contrary to the majority of spiritual traditions. When you think about it, it all makes sense. Spirit is often characterized as the opposite of “material” and the sunlight reveals the material world most dramatically in the daytime. Humans focus on the necessities of their material lives during the daylight hours. And although, in my view the sun is a mighty Spiritual presence, it is perhaps so over-powering by day that it’s energies mute more subtle spiritual activity. To seek a connection with Spirit at night, a quiet time when the blanket of darkness lays upon us, has a wholly “other-worldly” feel to it! Whether we go within to our inner sanctum during the day or night, Akbal suggests, one way or the other, we are wise to regularly take the time to do it. And don’t be contrary about it! This entry was posted in Uncategorized, Wellness and Spirituality and tagged contrary, Du'TSu, Grandmother Parisha, Mayan, night, Pa'Ris'Ha, Tzolkin, Wellness and Spirituality, WellnessAndSpirituality.net. Bookmark the permalink.